We all know that eating healthily and exercising regularly has dramatic benefits to our health and general wellbeing. If it were that simple we would all do it. Keeping healthy and exercising isn’t something all of us “just do”. For nearly everyone, keeping fit and exercising regularly is a skill that takes effort and discipline, which you will improve at. That is especially so for those who may be a little on the overweight side. Being overweight makes it even harder to get going as often exercise can be harder. In this blog, we hope to help you start exercising… not necessarily for you to start running marathons (which would be great), but just to help you get going. Let’s start exercising for the correct reasons – focus on the long-term benefits of exercise and only use short term goals (clothes sizes, waistline, reflections, etc) as quick motivational pushes. Just be the best YOU can be. If you’re trying your best then that is all you can do! Most people don’t master a new skill straight away. For example, learning the piano, or speaking a new language takes a great deal of time – there is no reason to treat exercise or healthy living any differently. The idea is to make small and positive changes that you can build on and do for the rest of your life. Finding what you love to do is literally half the battle. The other half is then putting the plan into motion. You don’t necessarily have to start running, spin classes, HIIT classes, etc. It maybe something a little different: Zumba, walking with friends, aqua-fit, etc. Whatever it is, find that exercise that rewards you mentally, emotionally and physically. Find what you LOVE TO DO! Your local leisure centre or Facebook are often good places to search for likeminded people and classes to get you going. Having goals is important, that goes without saying. Once you have found what you love- whether that is a karate class, playing on the Nintendo Wii Fit or walking on the beach. Start slow and focus on what you can actually do. There is nothing like going hell for leather to begin with to burn yourself out or get injured. You will always have greater success if you start learning this new exercise skill with someone else. It will be much easier if you have the physical and emotional support of friends and loved ones. Find a work buddy or get your partner to take up the new challenge. You’re more likely to be successful if both of you eat the same and exercise the same. To summarise, exercise is a skill like any other and it will take time to get better at it. Once you realise that and then find an activity you love you will then make that skill a life choice to benefit you for the long term, not just for a short fad. 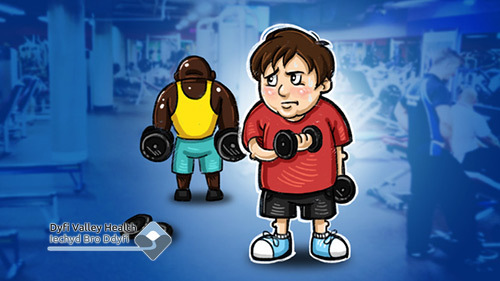 Starting exercising is not easy, especially if you are more on the overweight side of life. Don’t beat yourself up. Small steps and having the emotional support of loved ones, family or an exercise buddy will help you start this lifechanging journey. We are here to help you. For any questions or advice about your health get in touch with us and let us help you.